Discussion in 'Forum Games' started by 607, Apr 10, 2019. What's your experience with (text) adventure games? This is an idea I've had for a while, but needed more time for. And then I hosted a round of The First Loser instead... but here it is! 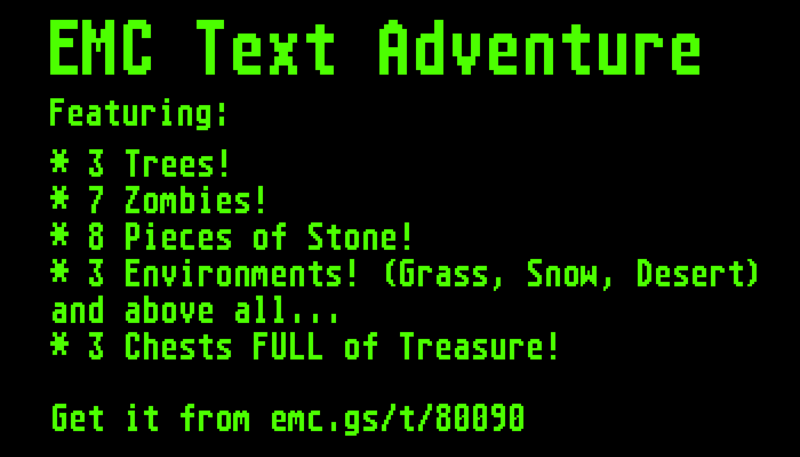 This is a text adventure, like you had them in the days before computers could display graphics. 7 players can sign up. I found this hard to decide, but I think it will be a good number. This also means that if some people drop out, the game will stay exciting. You moved East, and arrived at a tree. You chop it down. You have now got 1 piece of wood. You crafted a pick-axe. You have now got 0 pieces of wood, and a pick-axe. You moved North, and arrived at a river. You drown. You're back at spawn. You have got 0 pieces of wood, and a pick-axe. When you die, you return to spawn. Nothing else changes for you. You don't lose your inventory, and trees that you chopped down are still chopped down. Every person is in a copy of the same world. This means that if you pay attention and take reliable notes, when someone dies or finds a tree you will know what to avoid or where to find that tree as well. If you chop down a tree, that's only in your copy of the world, and other people can still get it as well. You are not obliged to take action every round. You may skip a turn. The 3 chests mentioned in the advert are only available once each. This is what is at stake. Everyone will get a little something for participation, but there are only 3 main prizes! The contents of the prizes are secret (and honestly, as of writing this I haven't yet organized any ), but each chest will contain one copy of a written book written for the winners of this game, signed by 607. SkeleTin007, CarFryer, LordKopecz and 2 others like this. Can I join? This sounds really interesting! 607 and jacob5089 like this. Remember that 'FULL of Treasure' is marketing talk. The main prize in each will probably be the written book (I mean, the set of 3 I auctioned went for 305k...), but each chest also has at least one promo. There's a tier system to the chests, the highest tier sharing some items (or types of items) with the lower tiers. If you get all three, you'll get some duplicate items. Any more participants, so we keep enough players even when some people get busy? The first round starts today! You all can post your first command. You spawned in in a plain. Where will you go? How many blocks do we travel for each move made? Hm, you already said you would go West! Did you change your mind, or...? The 'travel distance' is constant. So you could think '1 block', or '1 chunk', it doesn't matter, it can be abstract, but it is always the same in any direction from any position for any person. Oh ok I see, I was thinking we all where moving one player as a group. Maybe it'd be a good idea to reread the blue notes now that you know. I knew Rhy didn't have time this weekend, but LordKopecz and willies also haven't yet posted! For all I know this might be a tactical decision, but here's a reminder in case you just forgot! You are in a plain, with nothing around but grass. Note: the three of you obviously aren't in the same place (each of you moved into a different direction), you just got the same output because you happen to be in a similar place, at the moment! CarFryer and luckycordel like this. Has the second round started? Well, yes, you know where you are, so you can decide on your next action.